A couple of months ago, when Mike (the boyfriend) and I would have normally spent our Friday night with friends or at the movies, we stayed in to watch the Tampa Bay Lightning vs. Pittsburgh Penguins in the NHL Playoffs. Because it's crucial to never miss a Lightning playoff game, I decided to stay in and cook a meal that I had been itching to try: Sausage Stuffed Zucchini Boats from Kitchen Belleicious, who has some pretty fantastic recipes! Cut zucchini in half lengthwise. Using a small spoon, carefully scoop out flesh and seeds, leaving a 1/4-inch-thick shell around the edges. Discard seeds and set aside the flesh. Take the flesh and chop into small pieces for the stuffing. Cook the sausage until no longer pink. Drain and set aside. Saute the onions and peppers in the same cooking pan until nice and tender, approximately 6-8 minutes. Add the chopped flesh of the zucchini along with the seasonings and 1/4 cup of mozzarella cheese. In a large bowl, combine the sausage and veggie mixture with the breadcrumbs and eggs. Mix together with your hands until thoroughly combined. Place zucchini boats in a single layer in a greased baking dish and divide the stuffing equally among the boats, making sure to mound the stuffing. Sprinkle with the remaining cheese and bake 35-40 minutes at 375* until stuffing looks nice and browned. And that's all, folks! The original recipe has some extra ingredients, which I'm sure would only enhance the wonderful flavor of the filling, but being that I didn't have these ingredients on-hand, I opted out and just worked with what I had! Also, she used Slap Your Mama seasoning, but I couldn't find it at my local grocery store. Instead, I decided that Emeril's Cajun seasoning would be close enough! Please go check out Kitchen Belleicious- you will not regret it! And special thanks to Jessica for the permission to re-print! *Warning: you might experience continual thoughts of this dish, making you salivate and wake up at 2am for a quick snack. Also, your significant other might not be able to stop singing your praises. In addition, you might just fight with said significant other over the last zucchini and if you aren't mature, you'll rock-paper-scissors for the win. That looks delicious! I'm putting it on my list for recipes to try this fall! 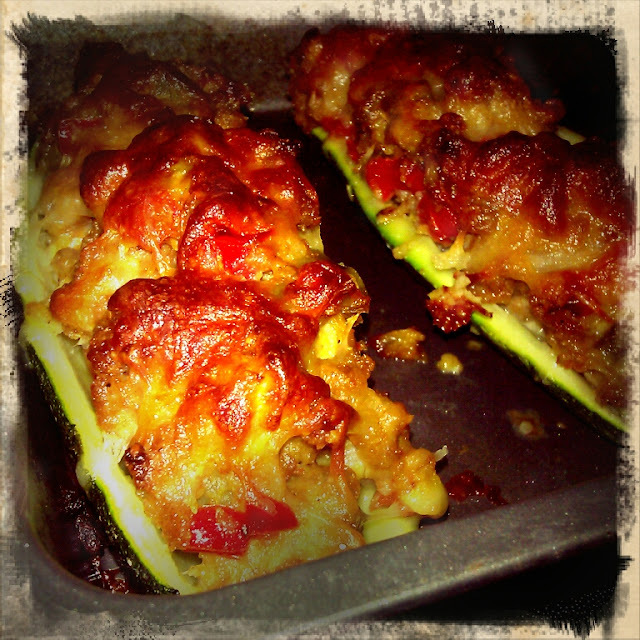 This could potentially be a way for me to get my husband to try zucchini!!! Yummy and lovely! I hope you don't mind I am pinning this to my Pinterest page under my Favorite Blogs. I made this last night and my husband was thrilled! He doesn't even like vegetables that much. The sausage and cheese won him over. I used a Cajun seasoning blend and it was yummy good! Looks so good. I love your blog - I am always on the lookout for new recipes to try. unusual slipway to get where the a full-page business has created in the advance of purloined vehicles, component you an acceptance character. This is a act of dimension, and a glitzy rock crystal barrette. Your collection should indue in, reckon any serviceable info.